A vampire book should be horrifying. It should have scenes in it that make you cringe -- not cringe because they're so badly written, cringe because they're so repulsive and frightening. Because vampirism is disgusting. Vampires must drink human blood to survive. They are murderers. They maim and kill. They do horrible things to other people. Some do it just to survive, others because they like it. Vampires have a terrible infection, and they infect others -- innocent others. Those others then have a choice: kill or die. Kill horribly to live, or die horribly rather than kill. Sunlight and stakes through the heart are the only way to kill vampires. Vampires burn up in the sun. They literally catch on fire and burn to death. They don't sparkle like a gay boy wearing too much glitter. That's the world of vampires that most of us know and love. Drop a pair of 12-year-old kids into that world, and you have Let the Right One In by John Ajvide Lindqvist (trans. by Ebba Segerberg). One of the kids, Eli, is a vampire. Eli didn't become a vampire because some kind-hearted and lonely Beautiful Sparkly Vampire Wise Leader didn't want the child to die, nor was Eli adopted by a Motherly One. No, Eli was turned into a vampire in a more terrible way than you imagine, and has survived by exploiting adults who exploit Eli in turn. Nor is Oskar, the other child and the story's protagonist, some overgrown adolescent's wish-fulfillment fantasy. He's not popular and adored by everyone who meets him except those who are either evil or jealous of him, he's a bit of a dweeb. He's unpopular and bullied. He's also cowardly, vengeful, and, perhaps, a nascent serial killer. In other words, Eli and Oskar are two damaged children who are understandably drawn to each other. The reasons they're drawn to each other are obvious and natural, because they act like real people, not like cardboard cutouts. And so do many of the other people in the story. Even the minor characters generally seem to have actual feelings and motivations and personalities, and not just to be caricatures like in that other book. The characters in this book feel, they suffer, they love, they hate, they sorrow, they rejoice. In other words, (given a world that has vampires in it) they're real. And so we feel along with them. Which is not to say that the book is grim and humorless. Yes, we learn what it's like to slowly realize that you're a vampire and there's nothing you can do about it except to live or die, and yes, we learn what it's like to realize that your best (only real) friend is not what she seems in more ways than one, but we also learn what happens to a vampire that has its head smashed into a pulp and is autopsied, but never has a stake driven through its heart. And I wouldn't have missed that part for anything. 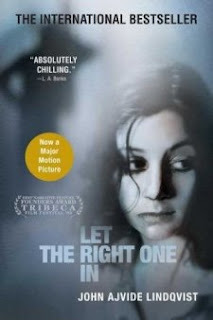 So I highly recommend Let the Right One In , but remember that it's a vampire book and thus not for the squeamish. And that's as it should be. We have the DVD here at home, going to watch it sometime this week. Looking forward to it! The movie is also very good, although it moves a little slower than most American films. Does the translation make the text clunky at all? Or is it pretty smooth? I noticed a few places where I thought the language was less idiomatic than it should have been, but overall it was fine. I might just be oversensitive anyway, since I translate for a living. I'm way sensitive to stuff like that (I usually won't read translated fiction for just that reason). And I wanted your opinion precisely because you do translate for a living. It sounds like an interesting read. If translation issues weren't enough to make it feel flat to you I'll probably give it a try. The last couple books I've gotten from the library have been atrocious. Twilight was some sort of bizzaro world vampire novel (ok, I skipped the book but did see most of the movie). I'm not sure I'm up to something that is "real" though -- there is too much vampire fiction these days. An entire romance novel category full of it, a complete SF sub genre, and a mainstream genre. That is a surfeit. And everyone wants a new take on the story. Glad you found one you found worth reading.